It's not about the software or the consulting. It's about the right balance of services, technology, and costs to achieve your business goals. This client needed help updating their business software to match unique requirements. "We feel we have a solid relationship that's provided what we need so far and that there's potential for it to grow to help us even more as we grow." 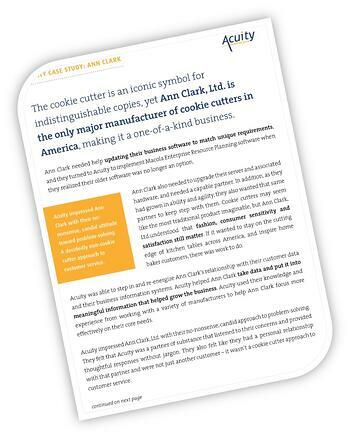 Kevin Coleman, Ann Clark LTD.
Clients choose Acuity because of our commitment, sense of loyalty, and reliability. Our knowledgeable and personable staff collaborate with clients to establish a successful new enterprise solution tailored to fit their company's needs. With our in-depth application software knowledge and more than 20 years of experience, the Acuity team will help your company optimize your investment and increase your efficiency and productivity! Five reasons to choose us.